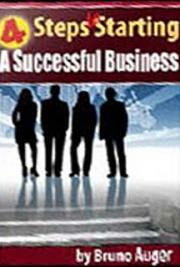 Download this FREE eBook, and learn 4 Simple Steps for Starting a Successful Business. Learn the basic ways to make a living online; the only ways to get meaningful information on the Internet; and the critical keys toward establishing your business online. Plus–Discover that single special element that you cannot afford to miss, without running the risk of having everything else go down the drain. Download today!